Hair removal used to be uncomfortable and unpleasant but with this laser hair removal system it can feel like a hot stone massage. Hair follicles are gently heated with gentle pulses of laser energy for long lasting results. 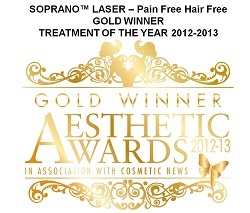 Only available on the Soprano system by Alma Lasers and exclusive to our clinic in East Anglia, we have had fantastic results and it is suitable for all skin types. Finer hairs can be dissolved permanently by using the DMK alkaline wash, see our DMK page under Skin Rejuvenation, Creams, DMK for more information.